Today, doctors in Colorado are reporting the first-ever recorded overdose from ingesting too much cannabis. The patient was an 11-month-old baby boy who had been suffering seizures. According to the report published by a team of doctors, the infant was admitted to the hospital after having a seizure. In the days leading up to his admittance, the baby was lethargic and heaving. Other than these problems, the boy was healthy. While in the hospital, the boy was unresponsive and got much worse. After doctors intubated him to keep breathing, his nervous system started to shut down. Suddenly, his heart stopped and doctors tried everything they could, from infusions to CPR, but they were ineffective. One hour later, the boy died. Following the boy’s death, doctors tried to find out what happened. They claim the boy had all the symptoms of a condition called myocarditis, in which heart muscles get inflamed. For some background information on this condition, you can look here. After researching the boy’s blood, doctor’s believe they found the culprit, THC or tetrahydrocannabinol, which is the main psychoactive ingredient in marijuana. Doctors looked for everything that could have caused the myocarditis, but they couldn’t find anything. 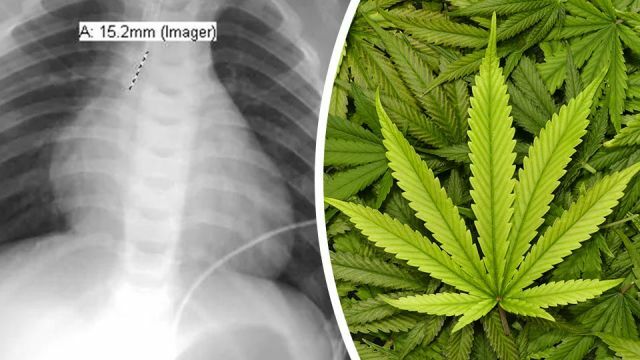 Due to the timing of the symptoms, team doctors believe that the child had consumed a lot of marijuana quickly and didn’t get sick from exposure to the substance over time, like people smoking around him. “In the age of legalized marijuana, children are at increased risk of exposure, mainly through ingestion of food products, or ‘edibles,’” doctors wrote. Previous articleDo You Know These 3 Hidden Dangers Of Touchscreen Devices? Hey Buddy!, I found this information for you: "Colorado Doctors Claim 11-Month-Old Died From Marijuana Overdose". Here is the website link: https://www.thealternativedaily.com/colorado-doctors-claim-first-ever-marijuana-overdose/. Thank you.